I am treating this site as one since the three churches are all part of the one foundation. For ease I will give each church its own page as they represent different points of time in the sites history. More detailed information about the location and difficulty will be given on the individual churches. I will give a general description of the site here and give some general history of the site – you can then click on a church to read more about it. Location of the site – OS: N 25 25. More precise co-ordinates are given on the individual site pages. The site is located on the N side of the Grand Canal W of Tullamore. Description and History of the site – This site is quite large and was once of certain importance. 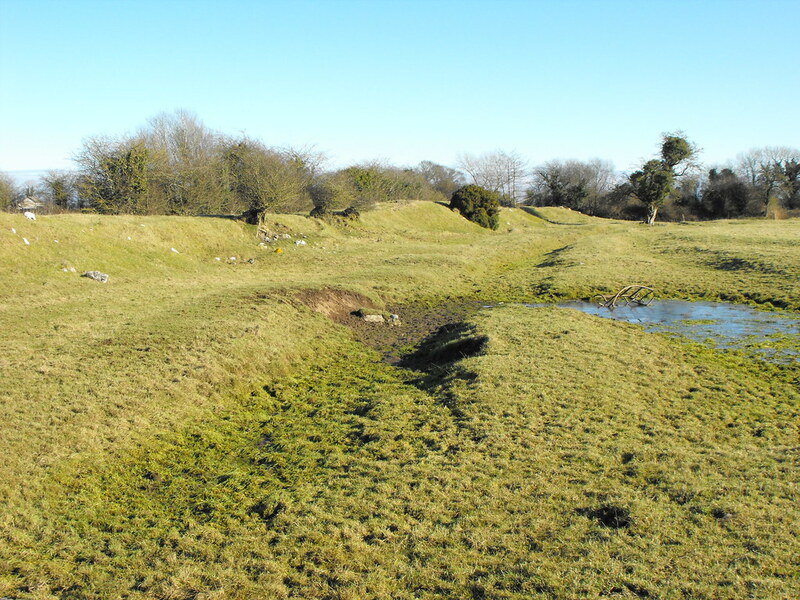 It was founded in the 6th century by St Carthach and the earliest features of this site may be represented by a ditch along the E-W and S sides of the site which may have been the sites original boundary. Arial photography has revealed possible former internal boundaries that may have been used for farming. The Clodiagh River marks the sites N boundary. Today three churches remain on the site. Two of these are Romanesque with one that has been incorporated in the modern Protestant church while the other is hard to date because of its poor condition. The modern church is still in use as is the graveyard. 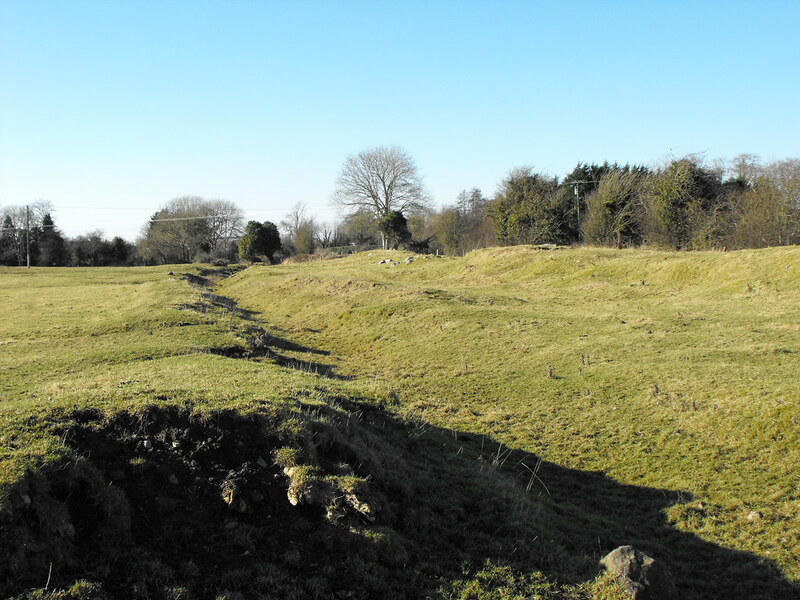 The site, when founded, was located between the Irish kingdoms of Delbna Ethra and Ferceall. It was common for monasteries to be founded on the borders of small kingdoms or between them. Little is known of the early foundation here but we do know some details of the 12th century at Rahan when the Romanesque church was being built. By the 12th century Rahan was highly corrupted and all the abbots belonged to the Ua Ceallaigh family. The family dominated the coarbship of Rahan and family feuds led to violence at here. In 1139 Cinel-Fhiachach was murdered at Rahan and Muircheartach Ua Maelmhuaidh was burned to death here. Similar incidents happened in 1142 and 1156. A Sheela-na-gig was also found at the site along with three late medieval grave slabs dating from the late 17th century. One of the grave slabs is marked with the date 1683 with the initials ‘C.M’ and may commemorate a man named Charles Molloy from Cartron who died in 1684 and had the slab made in his lifetime. It is decorated with a Maltese cross and a skull and crossbones. It is now located in the modern Protestant church but this church was closed upon my visit so I could not get in to see it. There is an illustration of the slab, however, in The Medieval Churches of County Offaly (see Resources). Difficulty - Easy to find with ample parking. Mind the cattle. Click below to read about the individual churches at this site. For more ecclesiastical sites click here. For more Romanesque churches click here. For more Gothic churches click here. For more sites in Co. Offaly click here. 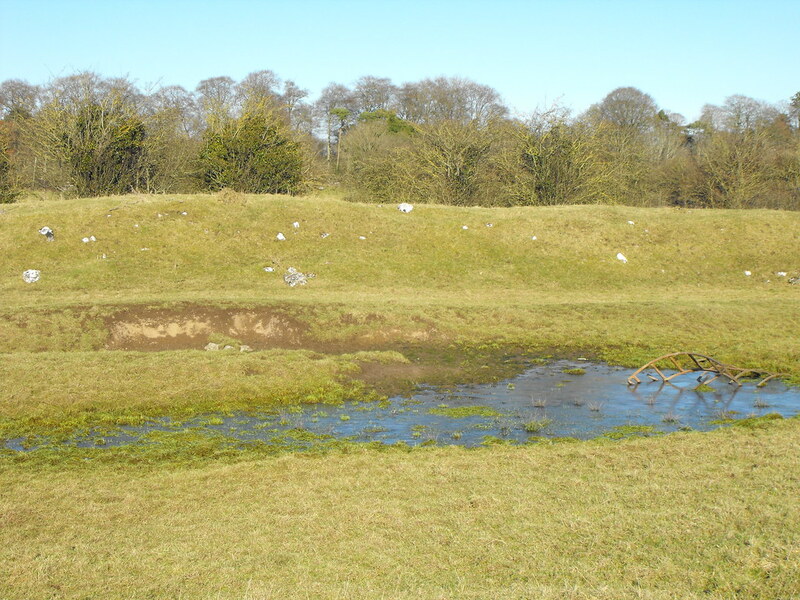 Some of the earthworks that make up the earliest foundation on the site.